Definition: Central Bank is the apex financial institution of the country, that administers the operations of the banking system. The bank manages and controls the expansion and contraction of the supply of money in the economy. A central bank has no direct interaction with the general public. Indeed, it functions as a banker to the other banks of the country such as commercial banks, cooperative banks, development banks, rural banks and so forth, as it maintains their deposit accounts and allots funds to them as advances, whenever required. Further, the central bank also acts as a guide to them, by providing the necessary guidance, when they require support. In addition to this, a central bank is a banker to the government also, and it keeps a track of government transactions such as the revenues and expenditures under different heads. Besides this, the central bank advises the government on various matters concerning the monetary and credit policies. It is the sole decision maker with respect to the fixation of interest rates of bank deposits and loans. Monetary Authority: The first and foremost function of the central bank is to formulate, execute and monitor the country’s monetary policy, with an aim of maintaining the price stability, so as to accelerate growth. 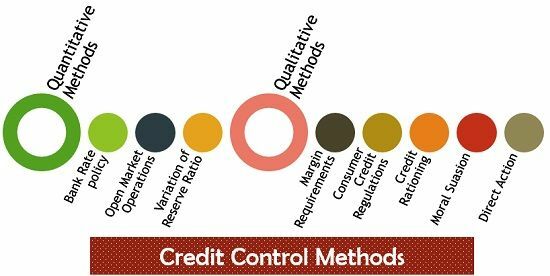 Credit Control: The commercial banks and non-banking financial companies create credit money, which is a substantial part of the total money supply in the economy. The shortage or excess of the money supply may have an adverse effect on the economy. So, in this way the central bank comes into the picture, to regulate the flow of credit, as per the needs of the economy, by using various methods. Administration and Supervision: The apex bank specifies a framework for banking operations, under which the banking and financial system of the country functions. Its purpose is to achieve public confidence in the banking system, safeguard the interest of the depositors and customers and also facilitate such banking services to the people which are cost-effective in nature. Issue of Currency: One of the basic function of the Central Bank is to issue and exchange currency, as well as destroy them which are not in circulation. Custodian: The central bank plays the role of a custodian, in for safeguarding foreign currency, gold and other securities. Clearing House: Due to its unique authority, a central bank can deal with domestic and foreign currency and so it undertakes clearing house operations, settlement of accounts as well as the interbank transfer of funds. Other functions: It performs a range of promotional and developmental activities to achieve national objectives. Reserve Bank of India or popularly called as RBI, is the central bank of the country based in Mumbai, Maharashtra. It is set up in the year 1935, under Reserve Bank of India Act, 1934 as a private organization, and after that it in the year 1949, it got nationalized. The bank is responsible for supervising and regulating the country’s currency and credit policy. It looks after the activities of the banks and financial institution of the country.